I tried to fight with the love to leopard print but.. I just can’t!! Beautiful! I feel like I need more leopard in my life after seeing this. This, my friends, is real beauty! Love her hat! It fits her beautifully! Beautiful girl, the leopard coat is fantastic! Few things make me happier than a sixties-style beret and leopard coat combo. The first thing that I thought when I looked at the photo was that it could have easily been a vintage photo. Everything about her is timeless and classic from the hair and makeup to the beret and even the leopard coat. Very French, very classic, very beautiful! And just the other day there was a report that beret production was at its lowest and today, rarely worn. This beauty just proves that it isn’t so! I thought a beret was too stereotypical, but she elevates it to classic. Also, a prime example of minimal French beauty. Sigh. Just bought the lovely lady in my life almost the same beret. Love them, so glad to see them making a comeback. 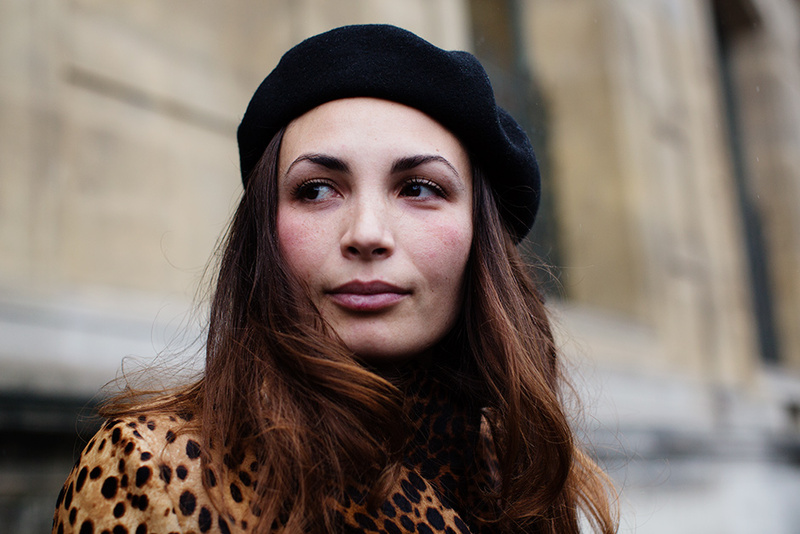 Love the beret: adds wonders to the leopard coat. Awesome parisian style outfits. Specially admire leopards prints. cool! Good work . Love the beret. Her makeup is very well done.. very pretty woman.